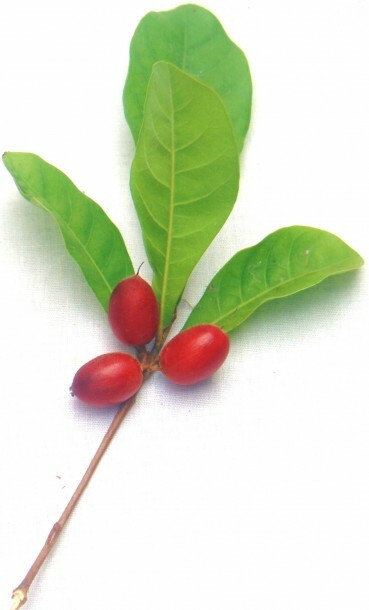 The táami berry (sometimes known as miracle fruit, miracle berry, magic berry, asaa and ledidi) is an extremely effective all-natural sweetener because of its active ingredient, Miraculin. Studies have proven Miraculin to be a completely safe, and remarkably effective alternative to sugar, high fructose corn syrup and unhealthy artificial sweeteners. The táami berry’s pulp contains a glycoprotein called Miraculin, a name that was derived from the seemingly miraculous affect that it has on one’s palate. When consumed, the amino acids and carbohydrates in Miraculin gently bind to tongue’s taste buds stimulating a remarkable transformation in the way acidic flavors are perceived. Acidity in food and drink is generally perceptible as sourness and bitterness, but when combined with Miraculin, the signal sent to our brains is that of sweetness. Thus, for anywhere from 20 minutes up to 2 hours, anything containing acidity such as lemons, limes and many other tart fruits will be made to taste significantly sweeter. Because glycoproteins are sensitive to heat, Miraculin loses its ability to modify flavor perceptions after it has been heated over 100° Fahrenheit. This has the massive benefit of not having any of the negative attributes of almost all commonly used sweeteners including sugar itself. The táami berry doesn’t have the calories associated with sugar, or the detrimental side effects of artificial sweeteners. Furthermore, with just one táami berry (or one serving of the crushed táami powder) your palate will be sweet for up to two hours. This means you don’t need to sweeten each cup of tea or coffee! According to studies performed by Harvard Graduate students in Boston, children actually preferred lollypops that were coated with crushed táami berry and contained no sugar over the ones that were coated with real sugar. When consuming sour, tart, and bitter flavors, scientists estimate that Miraculin is about 3000 times sweeter than regular sugar. Miraculin has also been found to combat urges for real sugar. Even if very few foods are eaten, the urge to consume sweets dissipates much faster than when eating normal high-calorie sweets. Sun, Hyeon-Jin, Hiroshi Kataoka, Megumu Yano, and Hiroshi Ezura. “Genetically Stable Expression of Functional Miraculin, a New Type of Alternative Sweetener, in Transgenic Tomato Plants.” Plant Biotechnology Journal 5.6 (2007): 768-77. Wiley InterScience. Monsanto Company, 13 Aug. 2007. Web. 5 Apr. 2009. <http://www3.interscience.wiley.com/journal/118001731/abstract>. Chen, Chang-Chih, I-Min Liu, and Juei-Tang Cheng. “Improvement of Insulin Resistance by Miracle Fruit (Synsepalum Dulcificum) in Fructose-rich Chow-fed Rats.” Phytotherapy Research 20.11 (2006): 987-92. Wiley InterScience. Web. 5 Apr. 2009. <http://www3.interscience.wiley.com/journal/112773497/abstract>. Ueda, Yuto, Taku Doi, Noriko Tsuru, Kohichi Tanaka, Jun Tokumaru, and Yoshio Mitsuyama. “Ionotropic Glutamate Receptors Expression in GLAST Knockout Mice.” Neuroscience Research 38.1 (2000): S64. Web. McVicar Cannon, Donna. “The Old Sweet Lime Trick.” Tropical Visions. Tropical Visions, 1 June 2004. Web. 5 Apr. 2009.<http://www.quisqualis.com/Cover02.html>. Adansi, MA, and HLO Holloway. “GERMINATION OF SEEDS OF THE SWEET OR MIRACULOUS BERRY SYNSEPALUM-DULCIFICUM.” Acta Horticulturae 53 (1977): 181-82. Ayensu, ES. “MORPHOLOGY AND ANATOMY OF SYNSEPALUM-DULCIFICUM-D SAPOTACEAE-D.” Botanical Journal of the Linnean Society 65 (1972): 179-87. Bartoshuk, LM, RL Gentile, HR Moskowitz, and HL Meiselman. “SWEET TASTE INDUCED BY MIRACLE FRUIT SYNSEPALUM-DULCIFICUM.” Physiology and Behavior 12 (1974): 449-56. Bartoshuk, LM. “TASTE ILLUSIONS SOME DEMONSTRATIONS.” Annals of the New York Academy of Sciences 237 (1974): 279-85. Brekke, J. E. “Tropical Fruits.” Encyclopedia of Food Science and Technology. Vol. 1. New York: J. Wiley & Sons, 1992. 2606-611. Breyne, H., C. Delaude, and J. Delaude. “MEDICINAL PLANTS AND MAGIC INGREDIENTS OF THE KISANGANI MARKET ZAIRE.” Lejeunia 93 (1979): 1-8. Brouwer, JN, D. Glaser, CH Afsegerstad, G. Hellekant, Y. Ninomiya, and H. Van Der Wel. “THE SWEETNESS INDUCING EFFECT OF MIRACULIN BEHAVIORAL AND NEURO PHYSIOLOGICAL EXPERIMENTS IN THE RHESUS MONKEY MACACA-MULATTA.” Journal of Physiology 337 (1983): 221-40. Web. 8 Apr. 2010. <http://www.ncbi.nlm.nih.gov/pmc/articles/PMC1199104/>. Buckmire, RE, and FJ Francis. “NTHO CYANINS AND FLAVONOLS OF MIRACLE FRUIT SYNSEPALUM-DULCIFICUM.” Journal of Food Science 41: 1363-365. Buckmore, RE, and FJ Francis. “PIGMENTS OF MIRACLE FRUIT SYNSEPALUM-DULCIFICUM AS POTENTIAL FOOD COLORANTS.” Journal of Food Science (1978): 908-11. Charley, VLS. “SOME TROPICAL FRUIT JUICES.” Fruit World and Market Grower 70 (1969): 22. Crosby, GA. “NEW SWEETENERS.” Critical Reviews in Food Science and Nutrition 7.4 (1976): 297-323. <http://www.informaworld.com/smpp/content~db=all~content=a915467943>. Eisner, T., and BP Halpern. “TASTE DISTORTION AND PLANT PALATABILITY.” Science 172.3990 (1971): 1362. Henning, GJ, JN Brouwer, H. Van Der Wel, and A. Francke. “MIRACULIN THE SWEETNESS INDUCING PRINCIPLE FROM MIRACLE FRUIT.” Pfaffman, Carl. 1969. 445-49. Kurihara, K., and LM Beidler. “TASTE MODIFYING PROTEIN FROM MIRACLE FRUIT HUMAN SYNSEPALUM-DULCIFICUM-D.” Science 161 (1968): 1241-243. Kurihara, K. “TASTE MODIFIERS.” Beidler, Lloyd M. 1971. 363-78. Kurihara, K., Y. Kurihara, and LM Beidler. “ISOLATION AND MECHANISM OF TASTE MODIFIERS TASTE MODIFYING PROTEIN AND GYMNEMIC ACIDS.” Pfaffman, Carl. 1969. 450-69. Lutterodt, GD, and S. Chona. “SWEETENING COMPOUND FROM SYNSEPALUM-DULCIFICUM THE MIRACLE BERRY OF GHANA.” Diabetologia 13 (1977): 45. Marchal, J., G. Montagut, and P. Martin-Prevel. “MINERAL EVALUATION OF SYNSEPALUM-DULCIFICUM-D.” Fruits (Paris) 27 (1972): 223-25. Montagut, G. “EXPERIMENTS ON SYNSEPALUM-DULCIFICUM-D CULTIVATION IN DAHOMEY.” Fruits (Paris) 27 (1972): 219-21. Solms, J. “Flavor-enhancing Compounds in Food.” Chimia 21 (1967): 169-75. Swenberg, ML, and R. Henkin. “ISOLATION AND PROPERTIES OF MIRACULIN FROM SYNSEPALUM-DULCIFICUM.” Lloydia 38 (1975): 544. Whitman, W. F. Miracle Fruit. Miami, Florida: Rare Fruit Council International. Wolff, G. “VEGETABLE SWEETENERS.” Therapie Der Gegenwart 112 (1973): 1950-952. Bartoshuk, Linda M. “Sweet Taste Induced by Miracle Fruit (Synsepalum Dulcificum.” Physiology & Behavior 12.3 (1974): 449-56. ScienceDirect (www.sciencedirect.com). Cagan, Robert H. “Chemostimulatory Protein: A New Type of Taste Stimulus.” Science 181 (1973): 32-35. Science (http://www.sciencemag.org). Web. 7 Apr. 2010. Cagan, Robert H. “Chemostimulatory Protein: A New Type of Taste Stimulus.” Science 4094th ser. 181 (1973): 32-35. Http://www.jstor.org/stable/1735921. Web. 07 July 2009. <http://www.jstor.org/stable/1735921>. Dateo, G. P., D. J. Vandenbelt, R. L. Buttrick, and L. L. Long. “Effects of Gymnema Sylvestre and Synsepalum Dulcificum on Taste in Man.” Olfaction and Taste. By L. M. Bartoshuk. New York: Rockefeller UP, 1969. 436-44. Print. Facciola, S. Cornucopia, A Source Book for Edible Plant. Vista, California: Kampong Publications, 1990. Print. Fairchild, David. Garden Islands of the Great East. NewYork: Charles Scribner’s Sons, 1943. Print. FARRELL, PATRICK, and KASSIE BRACKEN. “A Tiny Fruit That Tricks the Tongue.” The New York Times – Breaking News, World News & Multimedia. 28 May 2008. Web. 07 Apr. 2010. <http://www.nytimes.com/2008/05/28/dining/28flavor.html>. Fowler, Adam. “BBC NEWS | UK | Magazine | The Miracle Berry.” BBC NEWS | News Front Page. 28 Apr. 2008. Web. 07 Apr. 2010. <http://news.bbc.co.uk/2/hi/7367548.stm>. Grier, Jacob. “Miracle Fruit ? I?m a Believer!” Jacob Grier â€” Coffee, Cocktails and Commentary. 4 Feb. 2007. Web. 07 Apr. 2010. <http://www.jacobgrier.com/blog/archives/632.html>. H., J. M. “Miraculous Fruits of West Africa.” Bulletin of Miscellaneous Information (Royal Gardens, Kew) 1906.5 (1906): 171. JSTOR(http://www.jstor.org/page/info/about/policies/terms.jsp.). Web. 7 Apr. 2010. <http://www.jstor.org/stable/4111298?origin=JSTOR-pdf>. Hoyos, Jesu?s. Frutales En Venezuela: Nativos Y Exo?ticas. Caracas, Venezuela: Sociedad De Ciencias Naturales La Salle, 1989. Print. Hussain, R. A. “Sweetening Agents of Plant Origin.” Economic Botany 42.2 (1988): 267-83. JSTOR(http://www.jstor.org/page/info/about/policies/terms.jsp.). Web. 7 Apr. 2010. <http://www.jstor.org/stable/4255075>. Inglett, G. E., and Joann F. May. “Tropical Plants with Unusual Taste Properties.” Economic Botany 22.4 (1968): 326-31. JSTOR(http://www.jstor.org/page/info/about/policies/terms.jsp.). Web. 7 Apr. 2010. <http://www.jstor.org/stable/4252991>. Inglett, George E. “Http://www.jstor.org/stable/4255075.” Economic Botany 29.1 (1975): 6+. JSTOR(http://www.jstor.org/page/info/about/policies/terms.jsp.). Web. 7 Apr. 2010. <http://www.jstor.org/stable/4253556>. Ito, Keisuke, Tomiko Asakura, and Yuji Morita Yuji Morita. “Microbial Production of Sensory-active Miraculin.” Biochemical and Biophysical Research Communications 360.2 (2007): 407-11. ScienceDirect (www.sciencedirect.com). Kant, Ravi. “Sweet Proteins ? Potential Replacement for Artificial Low Calorie Sweeteners.” Nutrition Journal 4.5 (2005). Nutrition Journal(http://www.nutritionj.com). Web. 7 Apr. 2010. <http://www.nutritionj.com/content/4/1/5>. Kurihara, Kenzo, and Lloyd M. Beidler. “Taste-Modifying Protein from Miracle Fruit.” Nature 161 (1968): 1241-243. JSTOR(http://www.jstor.org/page/info/about/policies/terms.jsp.). Web. 7 Apr. 2010. <http://www.jstor.org/stable/1725882>. Kurihara, Kenzo, and Lloyd M. Beidler. “Taste-Modifying Protein from Miracle Fruit.” Science 161 (1968): 1241-243. Science (http://www.sciencemag.org). Lajafi, Sina. SWEET TART: AN INTERVIEW WITH ADAM LEITH GOllNER. Rep. Web. 7 Apr. 2010. <http://www.adamgollner.com/file_download/43/cabinet.pdf>. Martin, Franklin M., Carl W. Campbell, and Ruth M. Ruberte?. Perennial Edible Fruits of the Tropics: an Inventory. Washington, D.C.: U.S. Dept. of Agriculture, Agricultural Research Service, 1987. Print. Miracle Fruit by MagicalFruit: A Site Dedicated to the Wonders of Miracle Fruit. Rep. Web. 07 Apr. 2010. <http://www.magicalfruit.com/history.html>. Park, Madison. “‘Miracle Fruit’ Turns Sour Things Sweet.” CNN.com – Breaking News, U.S., World, Weather, Entertainment & Video News. 25 Mar. 2009. Web. 07 Apr. 2010. <http://www.cnn.com/2009/HEALTH/03/25/miracle.berries.weightloss/index.html>. Pilz, George E. “Sapotaceae of Panama.” Annals of the Missouri Botanical Garden 68.1 (1981): 172-203. JSTOR(http://www.jstor.org/page/info/about/policies/terms.jsp.). Web. 7 Apr. 2010. <http://www.jstor.org/stable/2398820>. Sun, Hyeon-Jin, Min-long Cui, Biao Ma, and Hiroshi Ezura. “Functional Expression of the Taste-modifying Protein, Miraculin, in Transgenic Lettuce.” FEBS Letters 580.2 (2006): 620-26. ScienceDirect (www.sciencedirect.com). Tripp, N. The Miracle Berry. Horticulture, January, 1985. Print. Tropical Visions. Rep. Web. 7 Apr. 2010. <http://www.quisqualis.com/mirfrtdmc1b.html>. Van, Atta Marian. Growing and Using Exotic Foods: Living off the Land with Marian Van Atta. Sarasota Fla.: Pineapple, 1991. Print. Wallace, J. F., and M. J. Wallace. Miracle Fruit: How Sweet It Is. Colville, Washington: Jenwa Enterprises, 1981. Print. Whitman, W. F. How to Grow Your Miracle Fruit. Print. Whitman, W. F. Miracle Fruit. Miami, Florida: Rare Fruit Council International. Print. Yamamoto, Chizuko, Hajime Nagai, Kayo Takahashi, Masahiko Yamaguchi, Mitsuo Tonoike, and Takashi Yamamoto. “Cortical Representation of Taste-modifying Action of Miracle Fruit in Humans.” NeuroImage 33.4 (2006): 1145-151. ScienceDirect (www.sciencedirect.com).